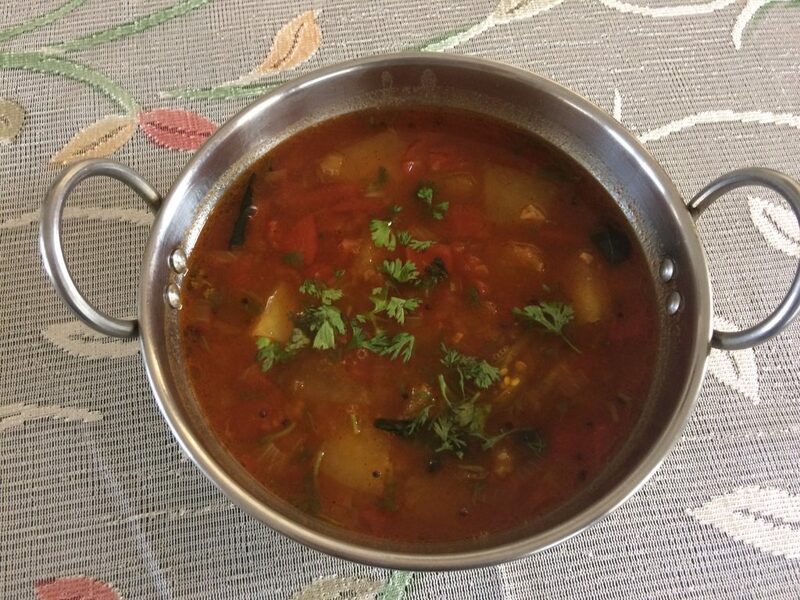 Sambhar is a necessary accompaniment to south Indian dishes. Be it Idlis, Medu Vada or even Steamed Rice. This is the recipe I have often watched my grandmother make. * The recipe to make Sambhar Powder. Step 1 Cook the Tur Dal in one cup of water in the pressure cooker. Keep aside. Step 2 In a heavy bottomed vessel cook the White Pumpkin with 1 cup of water. When 3/4th cooked, add Onions, Tomatoes and Green Chillies. Step 3 Once the vegetables are cooked and Tamarind Paste, Sambhar Powder, Turmeric Powder, Jaggery and Salt to taste. Mix well. Step 4 Add the cooked Tur Dal and 2 cups of water and bring to boil. Cover and simmer for 2 to 3 minutes. Keep aside. Step 5 For the tempering, heat the oil is a small pan. And add Mustard seeds. When the mustard seeds crackle, add Curry Leaves and crushed Garlic and saute for a few seconds. Step 6 Pour the tempering over the Sambhar and mix well.